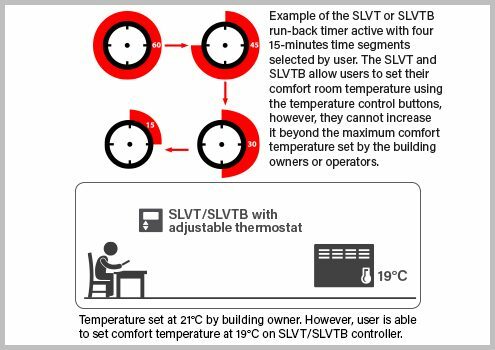 In addition to the run-back timer function, the SLVT offers temperature control and an easy-to-read digital display showing the room temperature. The SLVT has four status indicators and two operating modes which are set prior to the controller’s installation. It offers temperature control where users can set their comfort temperature using either one of the temperature control buttons, however, they cannot increased it beyond the maximum comfort temperature set by the building owners or operators. In Temperature and Timer mode, it acts as a 4-stage run-back timer where the heating period will be active until the run-back timer expires. There is a choice of three time periods available: 5, 15 or 30 minutes. When the button is pressed four times, this takes the run-back time period to 20, 60 or 120 minutes. In Temperature Control mode, it features temperature control for comfort and setback periods. – Temperature and Timer Control: Controller acts as a 4 stage run-back timer where heating period will be active until run-back timer expires. Target room temperature can be set using the temperature control buttons. – Temperature Control: Features temperature control for comfort and setback periods. In Temperature and Timer mode, it acts as a 4-stage run-back timer where the heating period will be active until the run-back timer expires. There is a choice of three time periods available: 5, 15 or 30 minutes. When the button is pressed four times, this takes the run-back time period to 20, 60 or 120 minutes. Target room temperature can be set using the temperature control buttons. 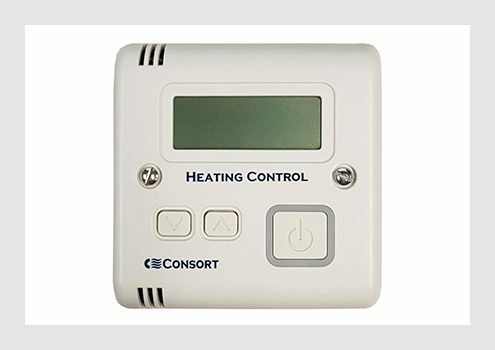 In Temperature Control mode, it features temperature control for comfort and setback periods which can also be used in conjunction with the Timer mode. This product is NOT suitable for use with a metal back box with 4 fixings. A metal back box with 2 fittings can be used. As the images below are for illustrations only, please ignore the depth of the back boxes.